While M-1 Global is receiving much flack for being the sole “obstacle” that’s preventing MMA’s biggest heavyweight scrap from going down, the Russian based company that manages Fedor Emelianenko claims Strikeforce determines who their superstar fights. Overeem ended his 30-month stateside hiatus this weekend by easily disposing of Brett Rogers. The Dutchman has been calling for a shot at Fedor for quite some time and did the same immediately following his 1stRound TKO inside the Scottrade Center in St. Louis. That may be an ideal scenario for Strikeforce, Showtime and “Ubereem,” but Team Fedor knows none of that can take place if Emelianenko can’t extend his winning streak to a ridiculous 28. 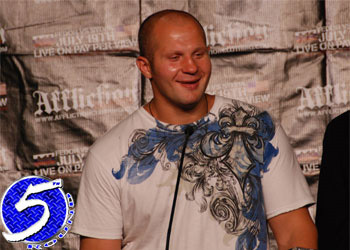 “At this point, Fedor is choosing not to look past Fabricio,” Kogan said. “He is in the most intense part of his training camp in Stary Oskol right now and would like for it to be known that he is focused 100 percent on Werdum. While Kogan claims it’s completely Strikeforce’s call as to who their client fights, everyone knows it’s never that easy when dealing with the Russians – as evidenced by Strikeforce CEO Scott Coker’s comments on trying to fill out Fedor’s Outlook calendar. What’s to discuss? According to Kogan, it’s your call to make, Scotty!